Hey, Texplainer: As a member of Congress, are there rules or restrictions on how much Joaquin Castro can promote his brother's run for president? Members of Congress, almost always from the same party, routinely promote each other’s campaigns. 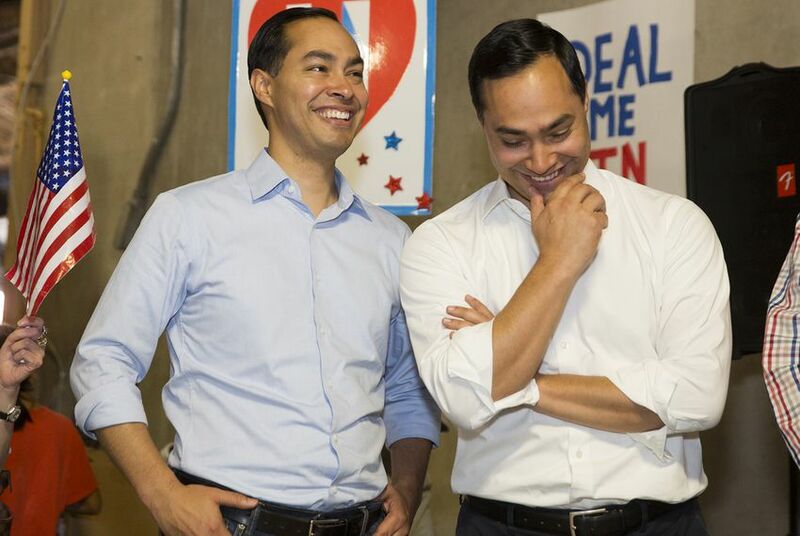 For his 2020 campaign for president, Julián Castro selected his twin brother, U.S. Rep. Joaquin Castro, D-San Antonio, as his campaign chairman. This is typically a volunteer position that involves managing big-picture tasks, while the campaign manager handles the day-to-day operations. Joaquin Castro will likely be speaking as a surrogate for his brother around the country. And this is not at all unusual. “It's very common in politics that politicians of a similar ilk get onstage,” said Tyler Cole, legislative director and counsel at IssueOne, a nonpartisan group that focuses on congressional accountability and campaign finance reform. In December, Joaquin Castro told The Texas Tribune that he would do "whatever he asks me to do. Everything. Reaching out to supporters and to folks who might be able to contribute to the campaign. Whatever he needs of me." But what if Joaquin Castro wants to spend money on his brother? He is restricted by the same rules as everyone else. He can personally give his brother a maximum of $2,800 (once in the primary and once in the general election). There are also some rules on what Joaquin Castro can do with his leadership PAC, Toward Tomorrow, which cannot coordinate directly with the campaign of his brother, the former San Antonio mayor who later served as U.S. secretary of Housing and Urban Development in the Obama administration. “It's unlikely [that there's a problem] unless there's some new type of behavior, like Congressman Castro wanted to spend money from his leadership PAC and ran ads. That would potentially raise a coordination problem,” Cole said. “But that is exceedingly uncommon, to where I can't think of a single occurrence where that has happened." The only other major restriction involves the difference between what members of Congress can do with their campaign staff versus what they can do with their office staff. As with all members of Congress, there is a “firewall” between Joaquin Castro's campaign staff and office staff. That is to say, he cannot use his official capacity as a member of Congress to send mail from his congressional office to support his brother, his congressional staff cannot volunteer for his brother’s campaign while on the clock and he cannot advocate they do so in their free time. However, his staff are welcome to volunteer for his brother’s campaign if they choose to on their own accord. Perhaps the most unusual incident in the twins' history is when Joaquin Castro took his brother's place in a parade without notifying anyone, and many of the parade-goers simply assumed it was Julián Castro. Barring an incident like that, Joaquin Castro is fairly in the clear when supporting his brother. “If Congressman Castro is just doing the usual song and dance of two politicians helping each other, he would likely be in compliance with all existing laws,” Cole said.